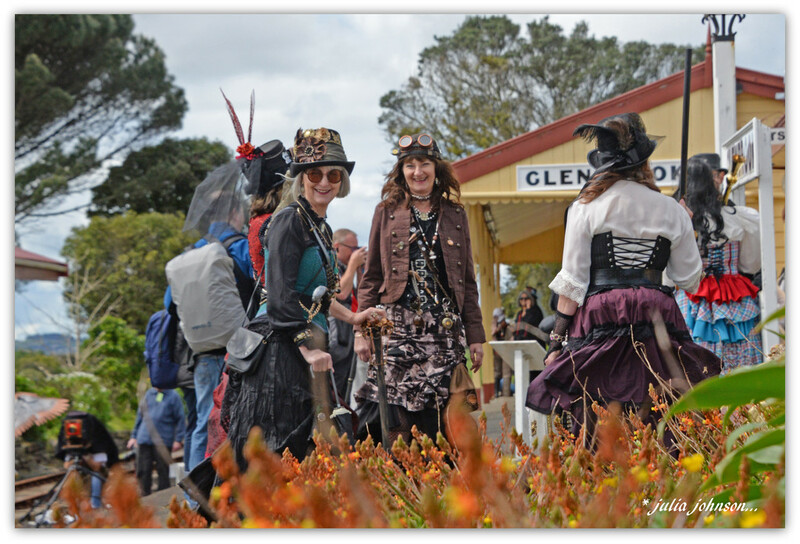 This group of happy Steampunkers were waiting for the train to come into the station.. They seemed to be amused that I crouched down below the flowers to take the shot.. Cool that they are looking your way and smiling at your pose! Shows off their outfits really well. It's interesting that so many of these events take place, and so many people travel from event to event dressed in their own particular steam punk style. Nicely captured shot. Don't they all look fabulous. Well worth getting down low to capture their smiles. I wondered if this was taken at Waikino station cafe but think not now, had to check the name online but it's not the same one. Love all this steam punk stuff, great people captures! The brilliant low down shot! @happypat it's at a Vintage Railway near where we are .. Glenbrook.. a great asset to the area.. Happy bunch aren't they? Must've been a great day out.